Thousands of Goose Creek residents poured into the local Pizza Hut Temple this morning to pray for a safe Daytona 500 race this afternoon. 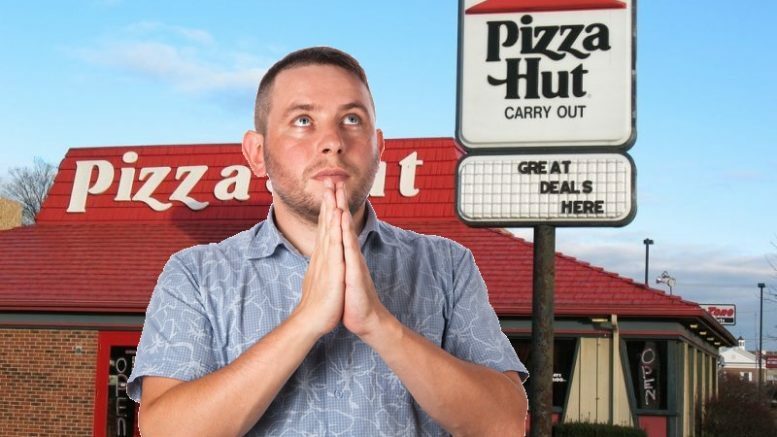 Greek Creecians recognize Pizza Hut as a sacred building for prayer because it’s the most historically relevant building in the city. Today is the holy day of Daytona 500 in Goose Creek and marks the beginning of the sacred NASCAR season. Changes to the NASCAR racing format and rumors of Dale Junior retiring have brought more followers out for the ceremony than in recent years. Goose Creek residents will watch the Daytona 500 this afternoon while drinking copious amounts of Bud heavy. When their drivers wreck 32 laps into the race, they will get angry and start shooting junk in their backyard. 1 Comment on "Goose Creek Residents Pray at Pizza Hut Temple For Safe Daytona 500"
I wish I saw this before the race! Priceless……as a former longtime resident of the area I can truly appreciate the time and effort you are putting into your Satire. Thanks!